October 2011 - Get Ready to Ride with the River Hawks!Get Ready to Ride with the River Hawks! I’ve talked a lot about getting your work done so that you have time for other things.. but what exactly are those other things? The answer is simple: WHATEVER YOU WANT. Once you completed your objective (your objective being homework), you can do whatever you like without anyone telling you no! (within reason). Might I suggest going to the RCC and get your sweat on, and while you’re there play some pick up basketball? Or perhaps attend one of the several concerts that happen in Durgin Hall through out the year? OR PERHAPS PLAYING ENDLESS AMOUNTS OF COD ON YOUR XBOX AND LAUGHING MANIACALLY AS YOU DESTROY YOUR OPPONENTS? Maybe. But the world is your oyster, do go catch it… or eat it… well you can’t really eat it until you catch it. So good luck, and get extra butter. OcToBeR: The time of Scary Movies! Have you seen any scary movies yet this month?? Me either. Do you have a weird opinion of the fact that Scary Movie parodied the parody Scream? Me too. Super excited to see a scream queen sit down to watch a scary movie for herself, put some popcorn on the stove and realize that she isn’t quite alone in her house as she runs through the most incovenient path through stairs and out of doors only to eventually succumb to the blade of a psychopath’s blade? You know I am. If you are looking for the opportunity to watch a fan favorite, but don’t want to watch it alone, go to Donahue Hall’s lobby this Friday to watch Hocus Pocus and get some free candy! Did I scare you? Totally did didn’t I? (Nailed it!) So we are in the scariest part of the year… OcToBeR. You know what that means! Foggy nights, colder weather, sweatshirts and jackets are a must, and of course.. HALLOWEEN! Have you come up with your costume idea yet? Are you going to still go trick-or-treating? Maybe have a scary party back home with some friends you haven’t seen in months? Maybe watching the nightmare before Christmas a bazzilion times?? Maybe going to the Halloween fair from the 24th-26th and carve some pumpkins, or go see the psychic show? There are a lot of things to do in this month! Keep your eyes open so you don’t miss out! Did someone do a No-Rain dance? It’s not raining today! I’m pretty excited about it. You should do something fun today. SLEEP. YOU SHOULD GET SOME. I’m not sure if anyone has yet run in to this problem (you probably have..) but college can be very stressful at times, and it seems like you have to sacrifice things in order to do well in school. Now, although this picture can be SURPRISINGLY CORRECT, (all jokes aside) I think that if you balance and manage your time well, you should be able to have all of these things and not just choose two! One thing that you really can’t let go of is enough sleep . Getting enough sleep is an incredibly important thing these days. One of my professors jokingly said one class that you don’t need to sleep, you only need to eat and drink some water and you can function daily. He was obviously trying to be funny, but it made me wonder if that was actually the case or not. 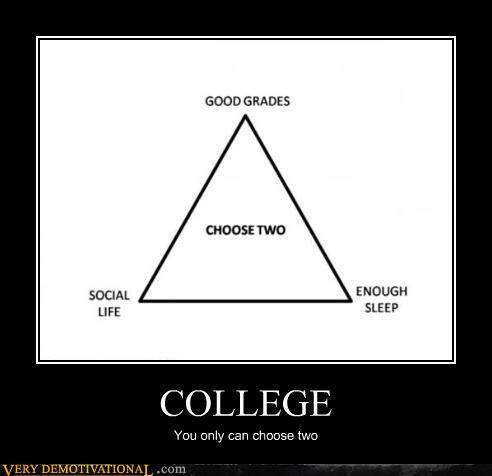 After my first all-nighter at college, I realized THIS IS NOT THE CASE WHAT-SO-EVER. I was shaking due to the four monsters I had consumed, I could not pay attention in class all day, and I had this odd feeling of wanting to pass out in the middle of the hallway, but all the caffeine I had consumed would not allow me to blink let alone shut my eyes for a few. This also lead to a lack of appetite, some head aches, and over-all grumpiness. Sure, all of my work was done for the day, but I pretty much was an empty shell in a desk for the day during all of my classes. When I finally went to bed, it wasn’t a very good feeling either. For some reason falling asleep before your head hits the pillow comes off as a BAD thing. 1) GET SOME SLEEP SILLY! 8-10 hours is the goal! If you didn’t put off the project to the night before, then there would be no need for an all-nighter. Try and space out the work as much as you can. I know, I know.. there is no better feeling than waking up at noon right? WRONG. Oversleeping can be just as bad as not getting enough sleep and can totally throw your body off for sleep the next day! So tonight set your alarms, and get to bed around 11 or midnight. Your video games and movies won’t go anywhere (I promise).